Hi, Chicsters today’s post is all about what I’ve bought 😞😍😉! I am working on my shopping habit guys Ive really gotten better, but because I’m always an optimist😉here is the bright side. 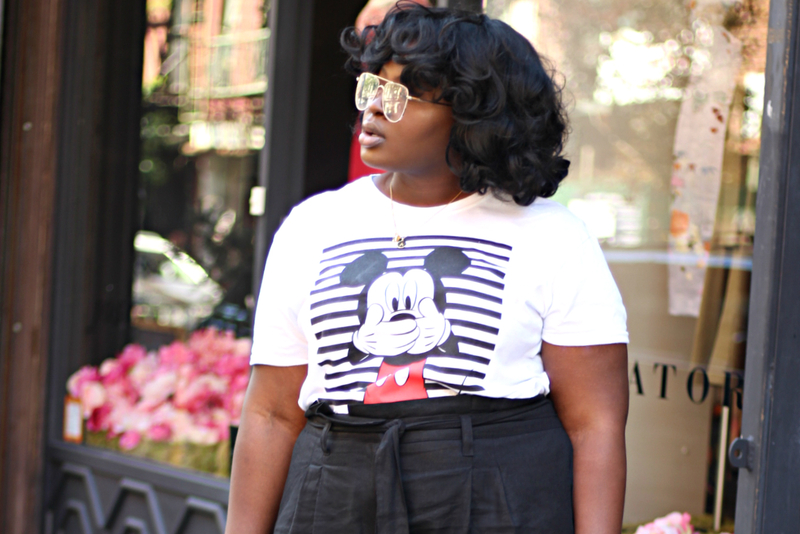 I wouldn’t be able to write this post or most posts at that if I didn’t shop! So at the beginning of every season I always make a list of what I want ( a plan of attack of sorts) and today I’ll be sharing with you the top items on the list and why you need them too. Cause friends who care share right…….. 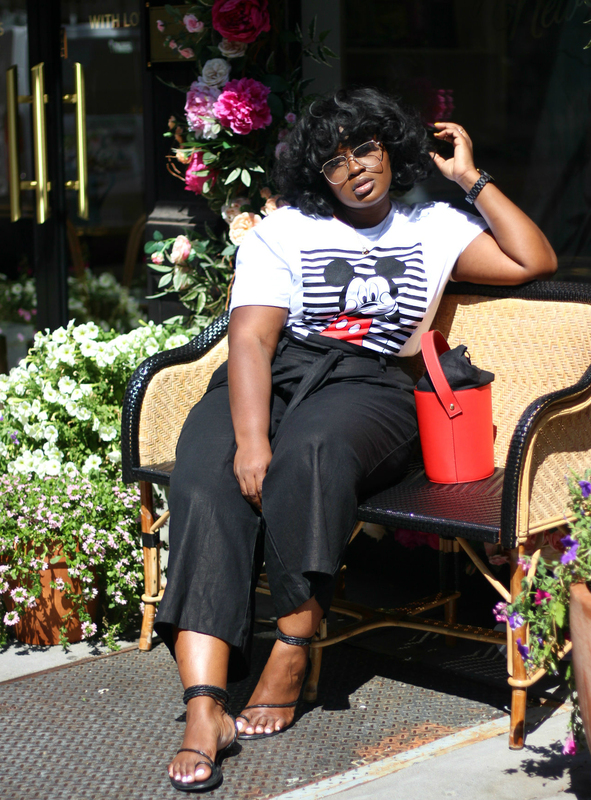 Continuing on I’m a pant girl but during summer time sometimes its just too hot for jeans so I proceeded to buy lightweight cropped soft pants. These are a Godsend because they are light flowy and will let air circulate!! Finally, the last thing I bought was a few pairs of white jeans sadly they where a failllllllll!! Still on the hunt for a pair of ecru colored white jeans that don’t show all my dimple is just high waist enough with the right amount of stretch I’ll keep you posted. Now this list above isn’t exhaustive I wish!! 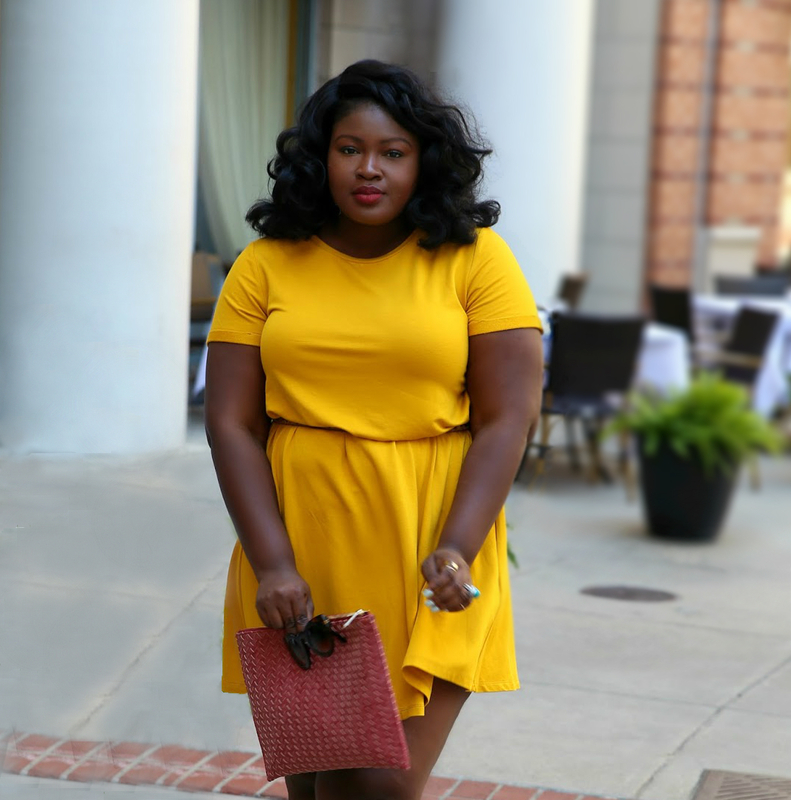 however, there is one thing on my list that has eluded me and that is a wide brim straw hat that will fit my hair when I have my weave/wigs on I want this one but its currently sold out in XL. I need an XL and a sale Brixton because the cheapo in me doesn’t want to pay $44 for a straw hat (FYI I have a hat from this brand their quality is A1 and worth the price). 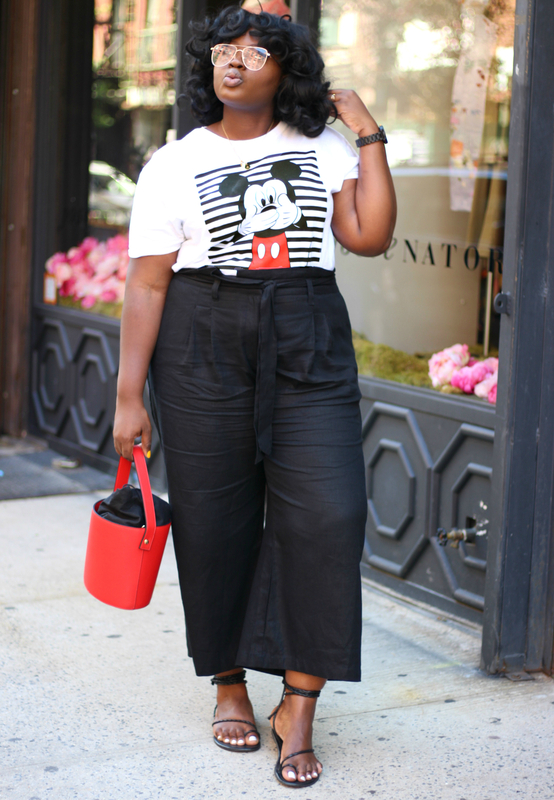 Let’s break down this outfit I wore these lightweight cropped soft pants that I’m obsessed with, and a graphic tee from Boohoo (who doesn’t love Mickey). 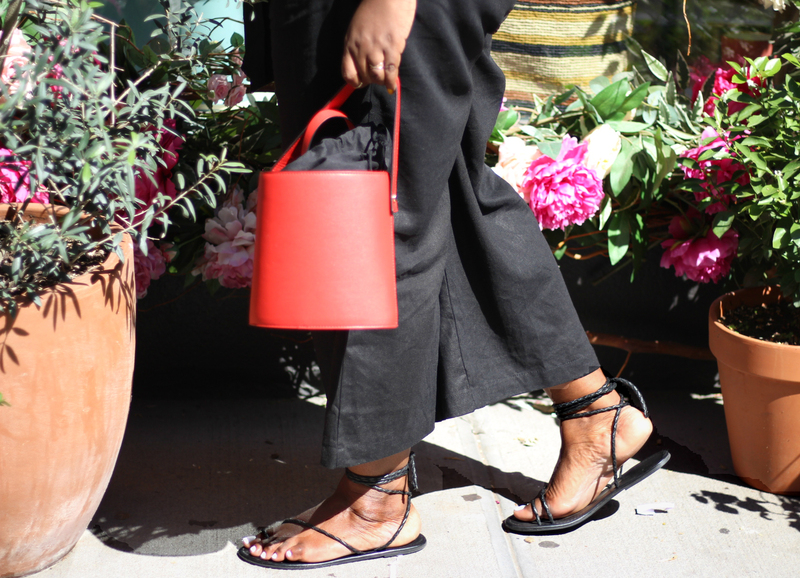 To add a little interest I paired the look with clear aviators, my red bucket bag and wrap sandals (from Asos). 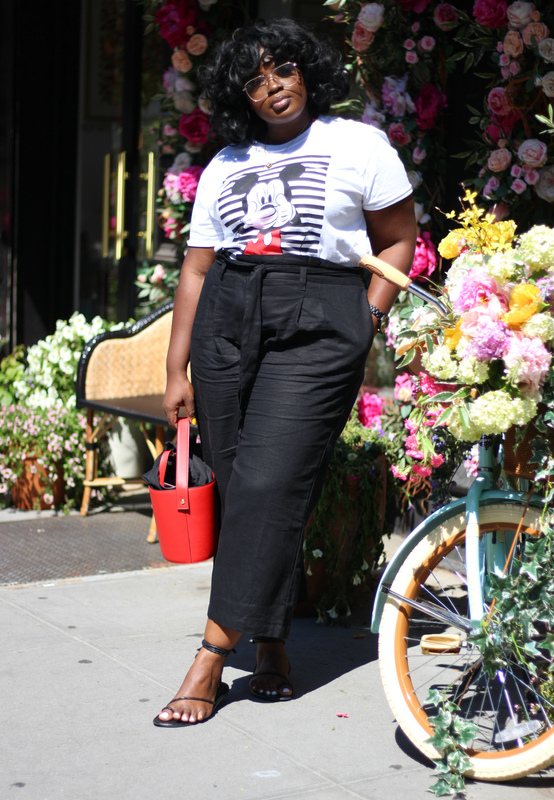 This outfit is perfect for a day in the city (walking/shopping) I was in NYC. I couldn’t visit NYC without shooting at the Sezane store, the store front is so ornate. Hopefully I get the vlog up on Youtube from the trip so you can see the kind of shenanigans that occur. Love those linen pants on You.